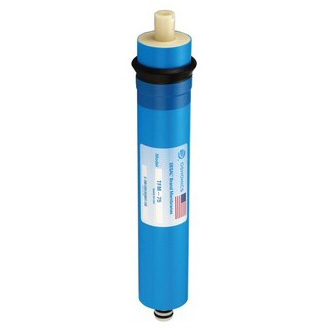 TFM 180 GPD Reverse Osmosis Membrane is a 150 gallons per day RO replacement water filter membrane for residential applications and for multiple bottleless water cooler brands. This thin film reverse osmosis membrane is also a great upgrade to standard Reverse Osmosis Systems and RO/DI systems as well as aquarium RO systems. TFM / TFC stands for "thin film composite" membrane, a low flow premium membrane that removes particles 100,000 times smaller than human hair. Flush the system for 5 minutes to prevent clogging. The first full tank of permeate should be discarded, it contains a sealant solution. Keep element moist at all times after initial wetting. This membrane will show some resistance to short-term chlorine exposure. Continuous chlorine exposure may shorten membrane life. Fits the following brands: FilterWater.com bottleless coolers, Pentair, Watts, Crystal Quest, APEC, PurePro, drinking water RO systems, as well as aquarium RO systems such as KENT, CoraLife, Seachem, AquaFx, SpectraPur and similar.